I love Post-It notes! I have drawers full of them. I use them pretty much daily. I have a rubber-stamp from Etsy (seller is CoolJapanStamp; see here for shop) of a To-Do checklist that fits perfectly on the 3" square Post-Its, giving me a portable To-Do list that can get moved from diary to desk to wherever. I also use some I got from Hema to flag up things either in my diary or in my writing notebook(s). One of the main uses I have though is to bookmark a page in a notebook so that I can flip back to the page easily. 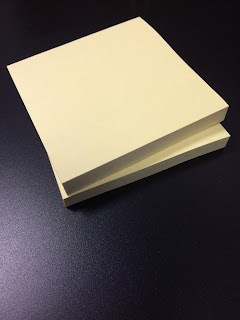 Sometimes these Post-It notes stick out of the top; sometimes the side of a notebook, but they are there with a note on to remind me how to get to a particular set of notes in the book. Who else shares in my love of Post-It notes? What else do you use them for? Drop me a line in the comments below.